Or get the deck & book set. Measurements: 3.8 x 5.4 inches, or 78 x 128 mm. Back of card: White with ornate pale gold scrollwork. Thin red edge, thin red inner border (box), two tiny, tiny red hearts in each corner. May be inverted. Booklet included: Yes, 32 pages, 3 x 5 inches, or 77 x 128 mm. English only. Publisher: Magic Realist Press. Made in the Czech Republic. Comments: Inspired by a 19th century German book of art engravings. A pretty deck in the Rider-Waite tradition. 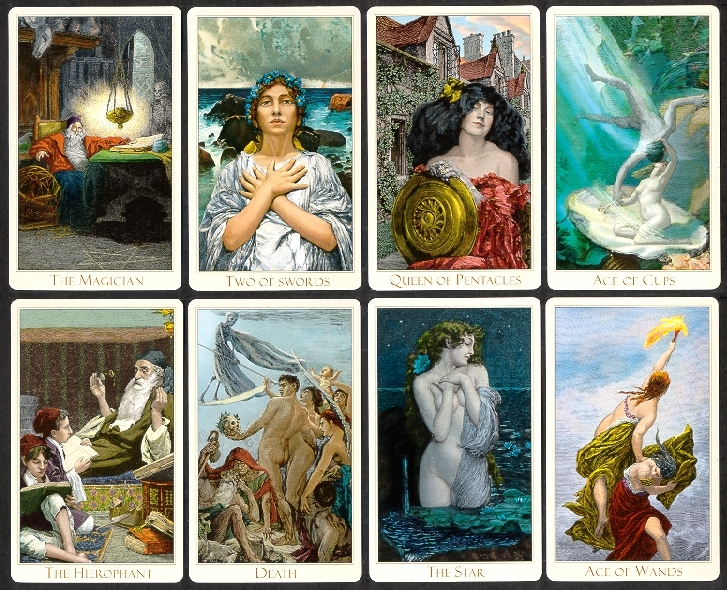 Illustrations used in the deck come from many different sources. The deck & book set gives full particulars in this regard.